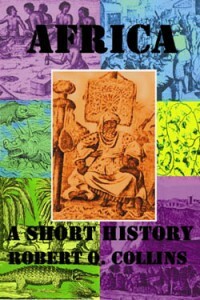 This is a concise but sweeping account of the African past, its peoples, and their institutions. The book attempts to provide an overview of African history without getting bogged down in details and data. This approach is very useful for general readers who seek to gain an understanding of the major trends and developments, and for teachers who plan to supplement this text with primary sources depending on the emphasis of the course. Beginning with the dynasties of the Nile valley, Collins explains the importance of language in identifying the enormous human diversity of the Africans, the evolution of African societies into kingdoms and empires through new social structures, the introduction of Christianity and Islam, and the migrations of various groups. The book then describes the appearance of the Europeans in the fifteenth century and the rise of the Atlantic slave trade. It continues with the brief but traumatic period of colonial rule and the nationalist movements for independence that ensued. Finally, it accounts for the struggles of Africans in recent years, including civil conflict, military dictatorships, and ethnic insurgencies, as the newly independent states of the continent mature.